Exactly, where on earth is that? Well I can tell you, it’s between Elephant Island and South Georgia on a bearing of 025-030 and about 619 nautical miles from South G in the expanse of Drake Passage. If you look closely on any recent satellite image you will see a small yacht with Kris Cunningham running around making Matt Hoey’s wets (drinks)! By Drake Passage standards in these parts of the World, the weather has been kind to us. We still require 7 layers of clothing, belt fed hot chocolate and the odd biscuit to keep morale up, but we are making good speed, averaging about 8 knots. The first 18 hours or so still required a very sharp look out for ice: the ‘Growlers’ were still around and these combined with low mist (and poor visibility) and the speed of the boat kept the mind, eyes and brain sharp. When you consider that a 1 meter cube of ice weighs approximately a tonne and many are much bigger than this, you don’t need a health and safety lecture to work out the implications of hitting one in a structure where water on the outside is a good thing and on the inside (in any great volume) is mostly undesirable and best to be avoided! This morning we had a short service on the upper deck; Commander Tim donned his cassock in the role of the AE16 Fleet Chaplain. We now realise that the addition of his Captain Birdseye beard actually fits many roles, Master and Commander, Monk and International Frozen Fish Monger. He is a man of many guises and talents! Once we had established if Josh Cowart (from Georgia, USA) was happy to continue without the presence of a rattle snake, we continued. The service was short and to the point, but also actually very apt and appropriate. 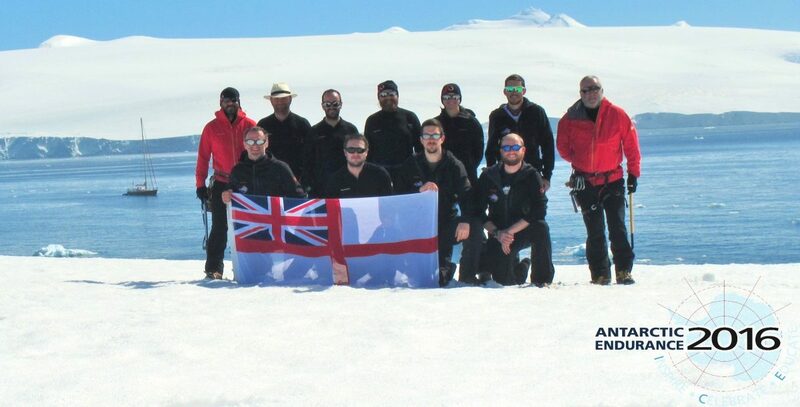 We took a minute to reflect that somewhere near us 100 years ago Shackleton and his men were in a small open topped boat at the mercy of these heaving, cold and merciless seas! Today we lost all readouts from our wind gizmos on the boat, no big issue as resorting to the basics is both OK and working, especially since Shackleton and his team didn’t have any; they had a jury-rigged sail, had to work out the weather from cloud formations and the wind and navigated with a hand held compass and a sextant trying to hit the equivalent of a needle in a haystack. If they missed it, the next stop would be certain death and being washed up on a South African beach. When you are literally following in their footsteps (and wake) you get a real and powerful understanding of their determination, courage and extraordinary achievements in the face of uncertainty and danger – it’s just simply awe-inspiring. On completion of the service, we awaited with baited breath for some wine, unfortunately the Monk had reverted back to Master and Commander, we weren’t even offered a fish finger sandwich – oh well! A few people have asked about the living conditions and routine aboard. Xplore is 67ft long by 17.4ft at the widest point (the Beam), so consider a single story Victorian terrace where 12 people work, live, sleep, cook, eat, wash and use the bathroom. However, in this space you also have your garage contents, all the extra boat stuff, spares for everything (if it breaks, we fix it), a big engine, generator, 1600 litres of fuel (your family car takes approx. 50 litres), gas, emergency equipment and enough food and fresh provisions for 12 people for 40 days; on top of this 12 x mountaineering bergans, tents, ice axes crampons etc, you get a general idea! The upper deck, where the boat is sailed from and a study just below which is the control centre for navigation, electronics, radar, warning systems, control panels for engines, lights, fire systems etc. We’re split into two watches; obviously our watch is the best and is known simply as the Alpha watch! The shift system is two 6 hour and 3 x 4 hour watches per day, regardless of weather, health, interest, or if you think your morale bag is toppers and you can’t possibly fit any more in, you can and you will! Within these watches we take it in turn to cook meals, clean and maintain as required. We are all in two man cabins with someone from the other watch which does give you some space to sort your stuff out; although I’m sharing with Matt Hoey, the other Mountain Leader, I’m a size 11 and he is a 9.5 boot, we still managed to wear one of each for a watch. WO Taff Davies, our expedition admin lifestyle coach, we need you! So how best to sum that up, imagine living in a two up two down with 12 adults for 40 days, only two sockets to recharge, minimal heating and the contents of your garage. Add to this the requirement to go and stand on your patio or decking for regular periods while someone sprays you with salt water and continually tries to push you over, and you won’t be far off; except for the sea sickness, you won’t get that in a Victorian terrace, neither will you have to pump your toilet 30-50 times to get waste to your sewage system! Now imagine that the 12 adults are in fact the in-laws and outlaws that come over for Christmas, now you understand fully why such great care was taken by Tim and Tony in the selection process! Anyway, hopefully that gives you a feel. In short we make it work, you have to, there is really no place for “me”, it doesn’t work, selfish attitudes or tendencies are highlighted very quickly, not tolerated, managed or changed and then the team emerges as a cohesive unit. We continue on our journey, so until the next Blog farewell. PS: Blog Correction, you may have noticed the last blog was written by our intrepid Scots diver Kris? Correction “Matt ye canny be afraid of a wee Matelot (Navy)”? And his elbow didn’t slip!